Today I’m back in Covent Garden – in the delightful surrounds of Neal’s Yard. It’s a really cute, characterful area that is home to sister restaurant to The Palomar which I visited recently. 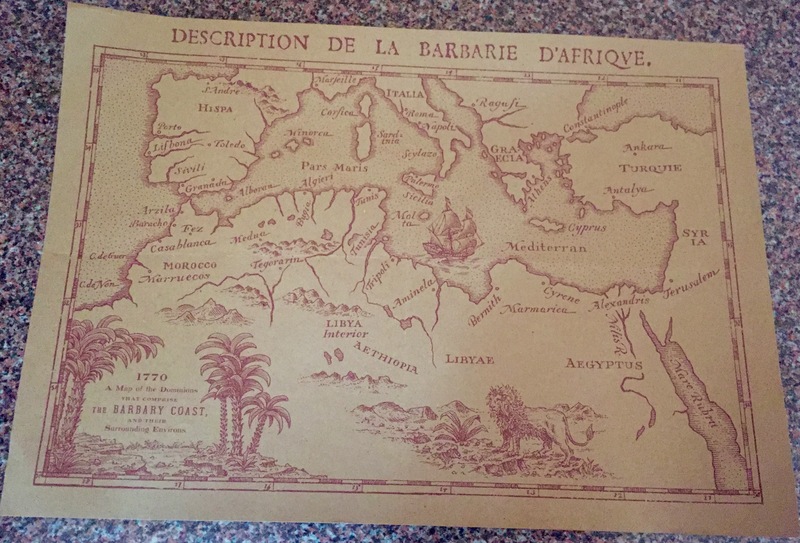 The Barbary takes its inspiration from the Barbary Coast – an area around the Atlas Mountains which includes Morocco, Algeria, Tunisia and Libya. The area was infamous for its pirates and until the beginning of the 20th century was home to the Barbary lions which are now sadly extinct. The menu reflects these countries from the Atlantic Coast and also through to the Mediterranean Sea and Israel. It makes for an amazing mix of ingredients and some of the most stunning and different food I’ve eaten in a while. Food comes in tapas-size portions so there are plenty of opportunity for tasting. Seating is around the bar looking into the open and buzzing kitchen. You can’t book so there’s always the risk of queuing (one of my pet hates) so I’d recommend you go for a later lunch (after 2pm) or an early dinner (around 6pm) and you shouldn’t have much of a wait. It’s the sort of menu that needs some explanation before those big decisions are made and the staff are very keen to help and describe the dishes with passion. They make them all sound so good but even once you’ve been guided by their knowledge you’re still not sure what you’re going to get. It’s just food I hadn’t encountered before but the good news is there’s no need to stress – I’m telling you that whatever you order is going to be fabulous. Make sure to start with the Araya which is in the snack section. 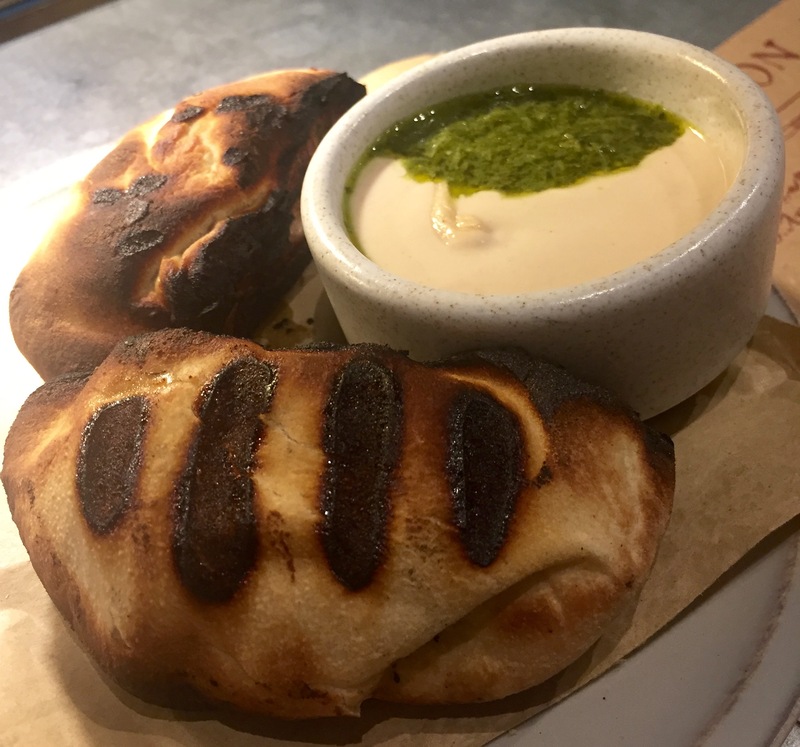 Little parcels of mince grilled on the fire and served with a tahini-style dip, these are sausage rolls in a league of their own. 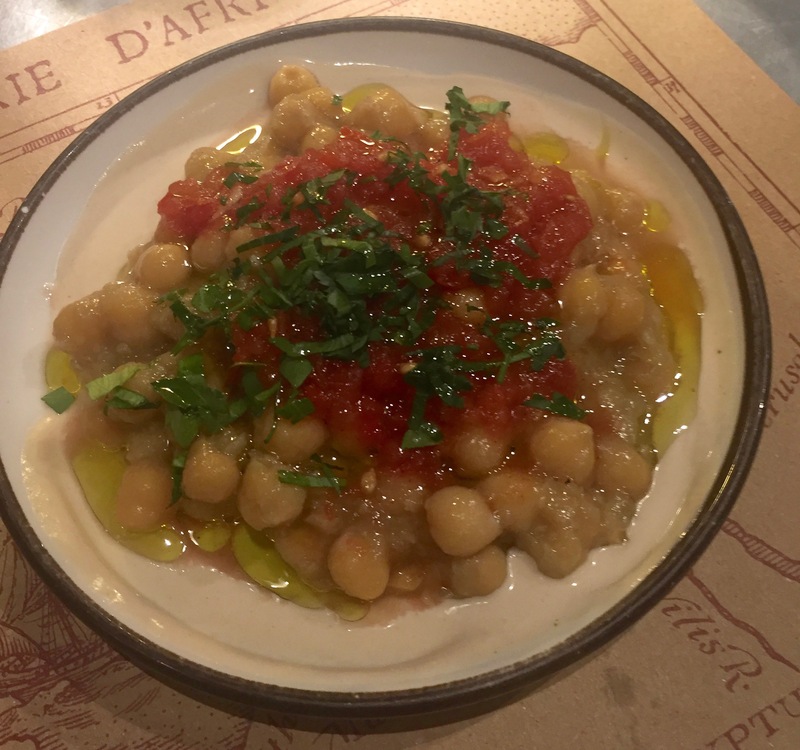 Masbacha chickpeas are soft and succulent with a wonderfully herby dressing. 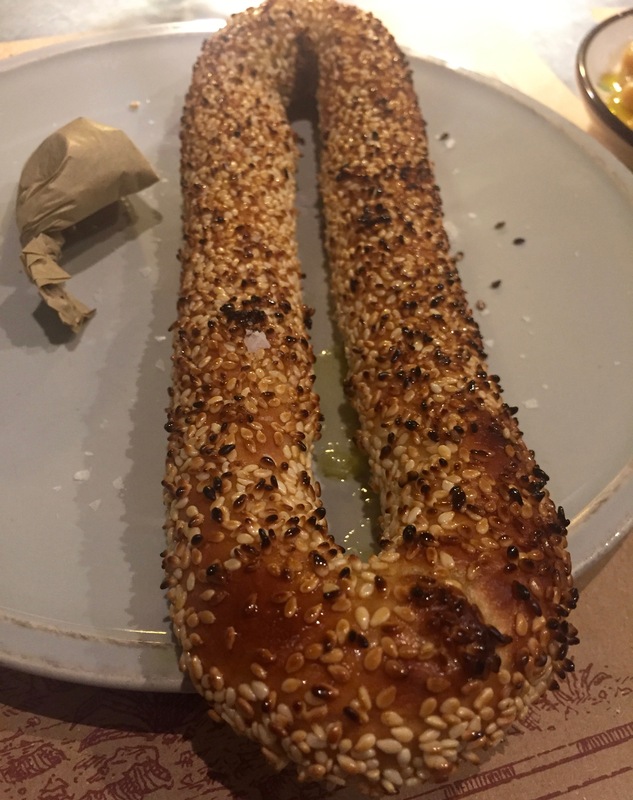 And then there’s the Jerusalem bagel, a tasty, elongated delicacy generously coated with sesame seeds and served with a twist of spices on the side for dipping. I am partial to a bit of chopped chicken liver and again this is spectacular, I think my favourite dish of the day. 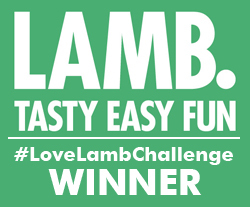 It’s chopped with hard boiled eggs and spring onions and served with a creamy, mustardy sauce. Another combination made in heaven. 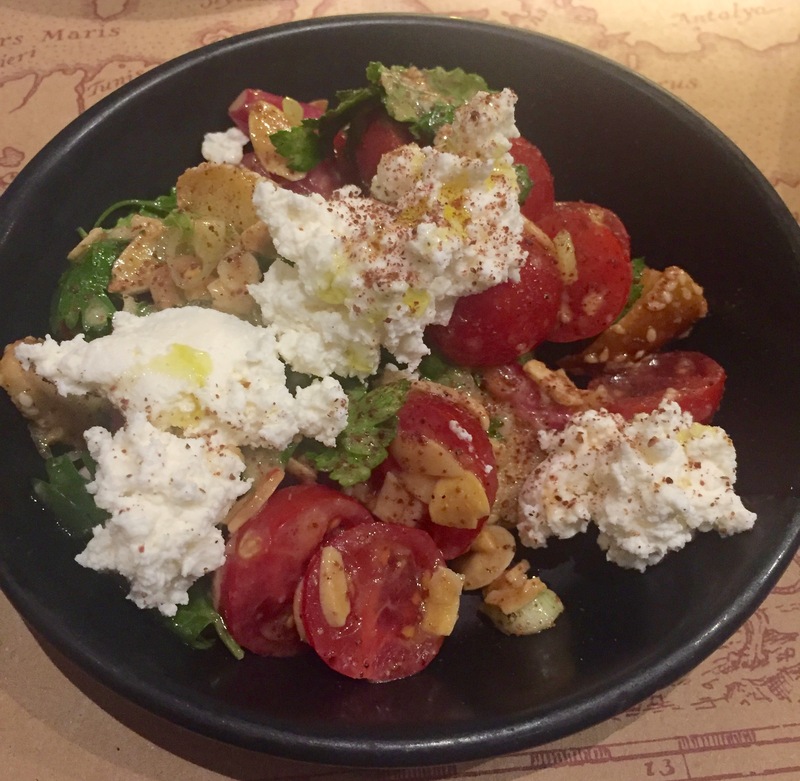 The fattoush salad of chopped tomatoes and herbs is topped with the creamiest whipped feta and a lovely limey dressing. A real star of a salad. 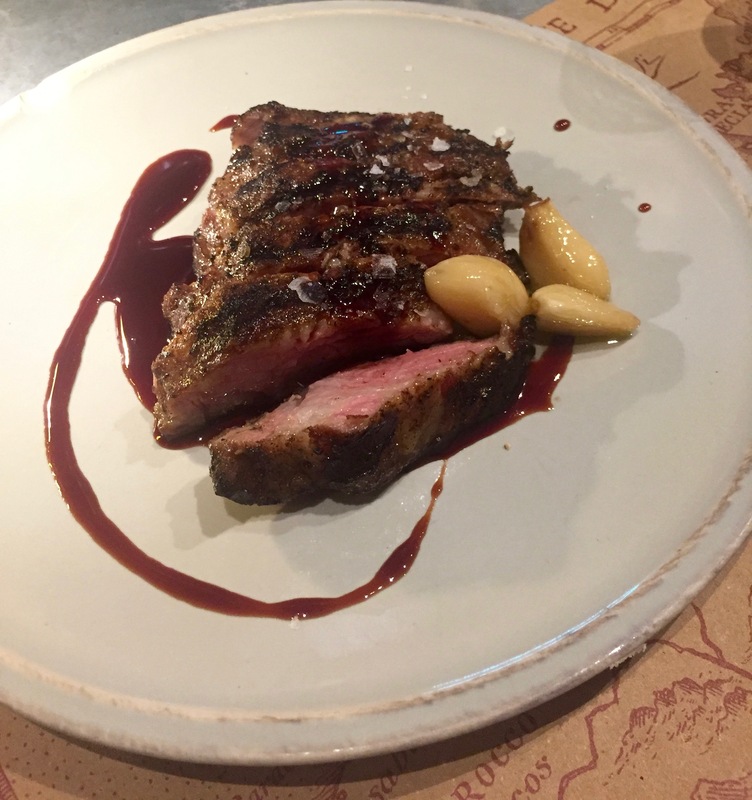 Our waitress enthusiastically recommended we order the pata negra neck which came with golden bulbs of roast garlic. I don’t really have the words to describe this amazing piece of meat. Rare and tender with a lovely charred crust from the fire, it melted on my tongue, the richest of flavours dancing across my taste buds. 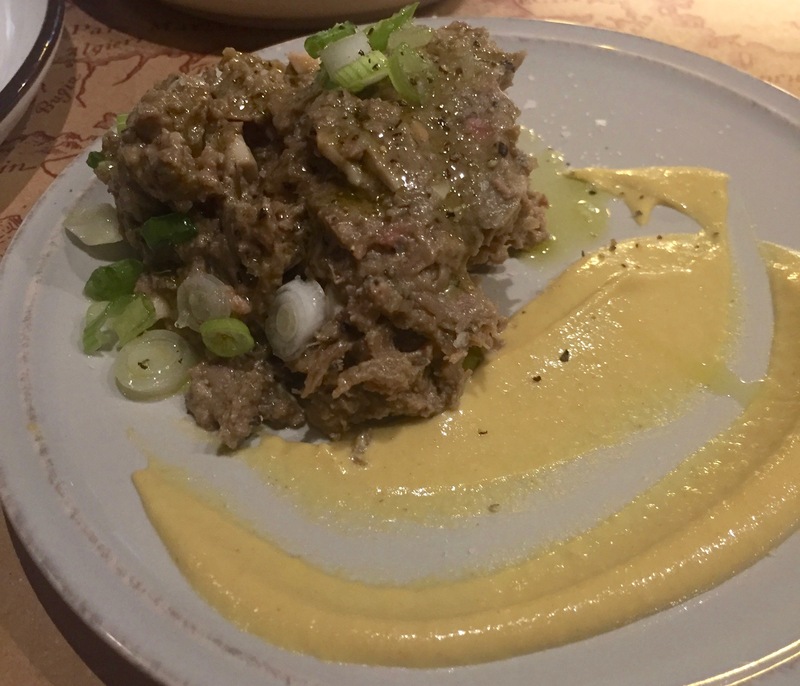 The Barbary’s bread is also stupendous. 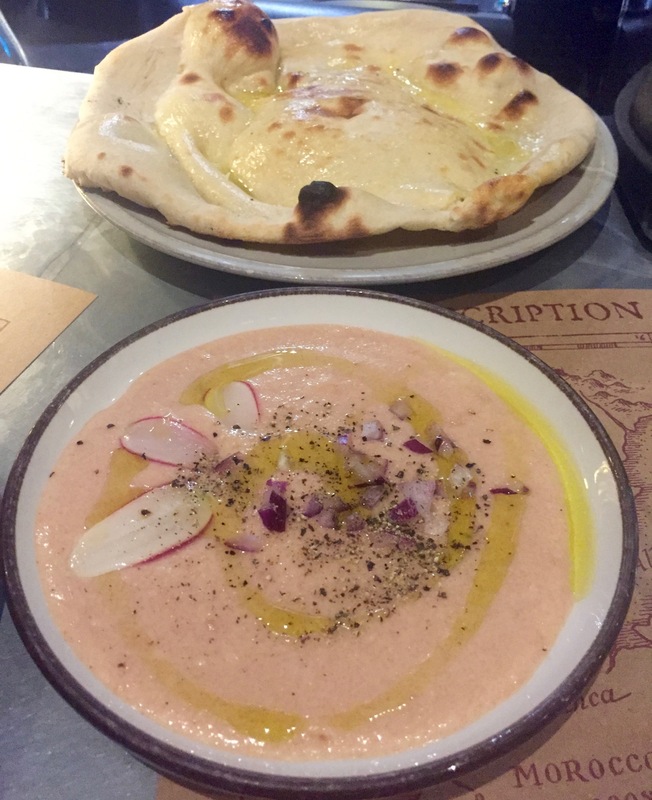 This amazing buttery nan was the perfect partner for the fishy taramasalata-like dip in all its pinkness. The final wonder today is the goat. 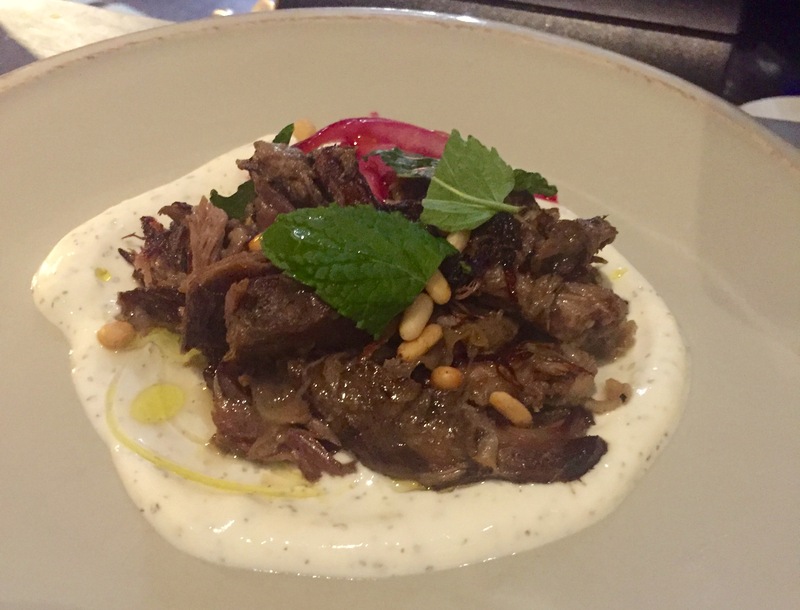 The second time I’ve seen goat on a London menu recently, it was roasted, shredded and crisped up on the fire. Served on a bed of garlicky tzatziki and topped with pickled red onion and fresh mint. Wow! I loved the mats which give you a clear picture of the region that’s inspired this marvellous food. 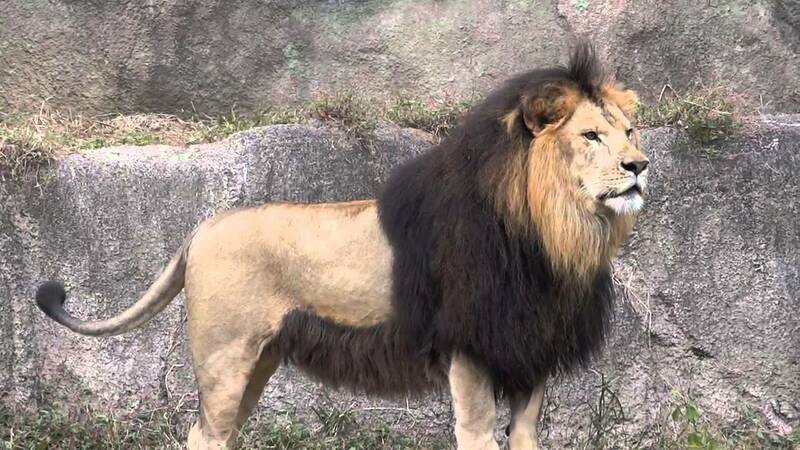 I thought I’d also treat you to a picture of the beautiful Barbary lion with its dark mane that goes all the way around its stomach. They needed to keep warm up in those Atlas Mountains. This array of dishes cost around £70. Wine starts from £29 a bottle. The Barbary is at 16 Neal’s Yard, Covent Garden.